What do these goaltenders have in common? Besides being the last line of defense on some of the hottest PRO teams, they are all members of the EYECANDYAIR goalie family and wearing custom creations painted by Steve Nash! EYECANDYAIR is extremely proud to say that we have been able to realize a dream by having the opportunity to work with some very talented net minders over the last few years! Here in our "1st STAR OF THE GAME" section we showcase some very unique one of a kind AUTHENTIC PRO goalie mask EYECANDY. Connor Hellebuyck, is currently a goaltender for the Winnipeg Jets. 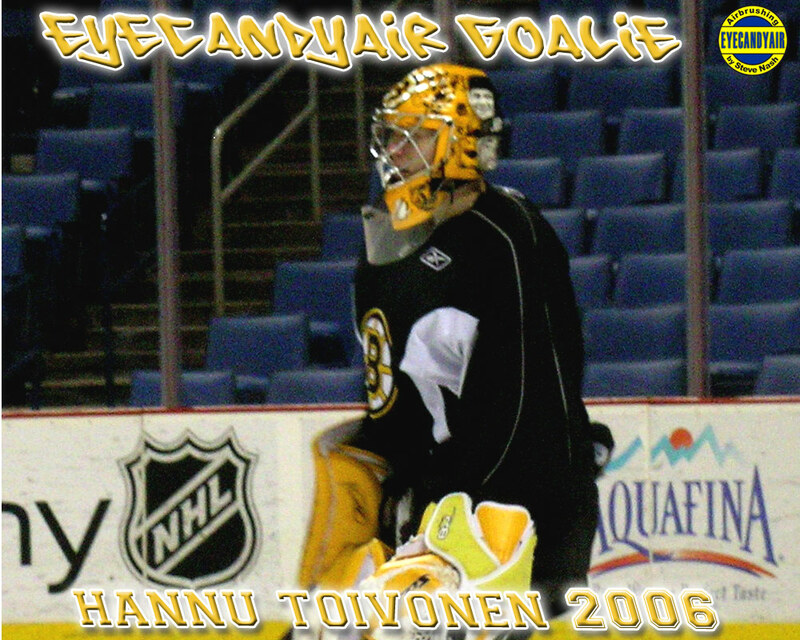 He wears a Vaughn (made by Pro's Choice) goalie mask airbrushed by Steve Nash of EYECANDYAIR. Martin Jones, is currently a goaltender for the San Jose Sharks. 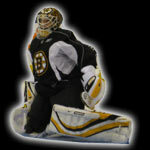 He wears a Vaughn (made by Pro's Choice) goalie mask airbrushed by Steve Nash of EYECANDYAIR. Jonathan Quick #32, is a goaltender for the Los Angeles Kings. Winner of the 2012 and 2014 Stanley Cup and 2012 Conn Smythe Trophy. He was also part of the "2010 Winter Olympics" Team USA that brought home the Silver Medal. 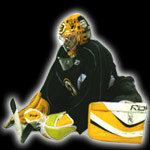 He wears a Sportmask Pro goalie mask airbrushed by Steve Nash of EYECANDYAIR. Ben Scrivens, is currently a goaltender for the Montreal Canadiens. He wears a Bauer goalie mask airbrushed by Steve Nash of EYECANDYAIR. 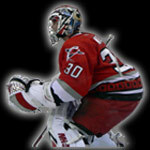 Cam Ward #30 is a goaltender for the Carolina Hurricanes. Winner of the 2006 Conn Smythe Trophy and Stanley Cup. Cam was also a part of "2007 IIHF World Championship" Team Canada that won Gold as well as the 2008 team that brought home the Silver Medal. 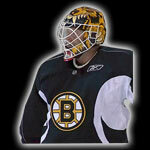 He wears a Sportmask Pro-Custom goalie mask airbrushed by Steve Nash of EYECANDYAIR. 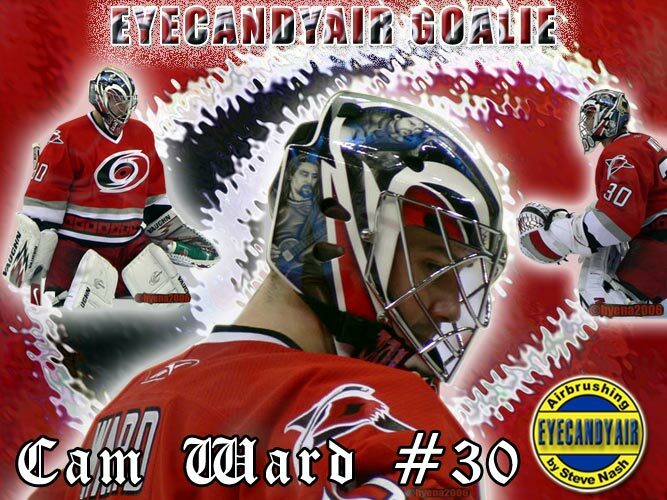 Cam was featured on the front cover and inside the Summer 2007 issue #63 of Goalies World Magazine wearing his Carolina Heritage airbrushed EYECANDYAIR goalie mask. 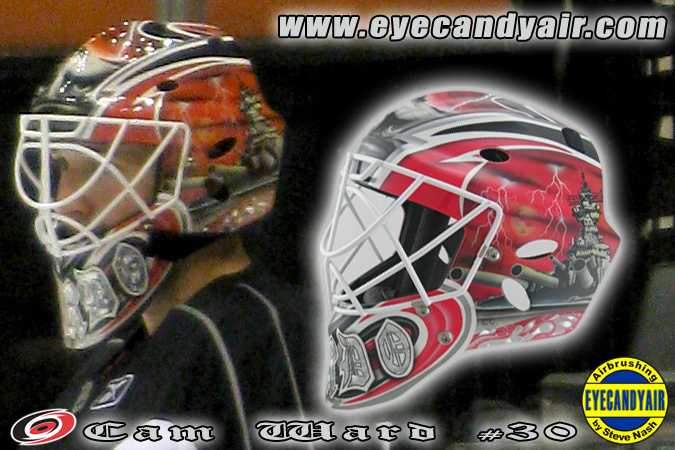 Below are some of the professional goaltenters EYECANDYAIR has had the opportunity to work with in the past. Martin Biron (now retired) was a goaltender for the Philadelphia Flyers, New York Islanders and New York Rangers when we had the opportunity to paint his masks. 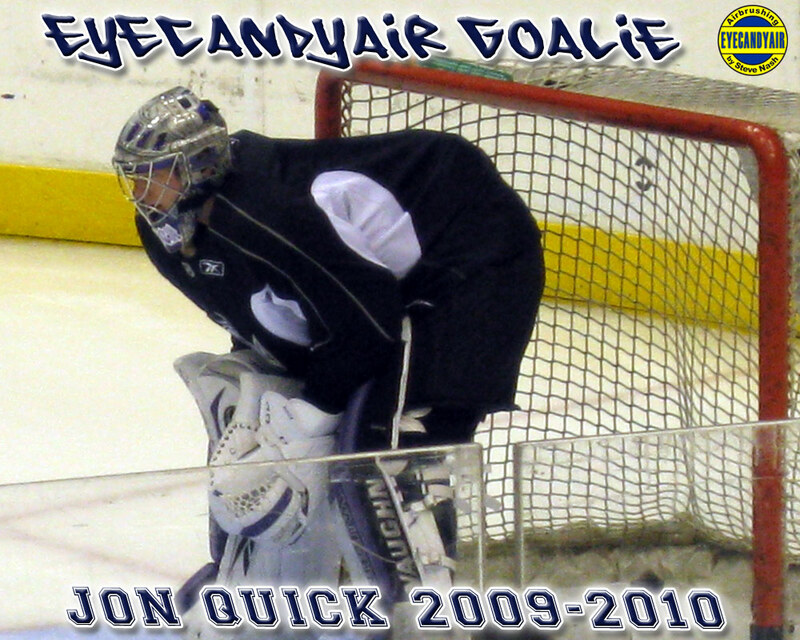 He wore a Bauer goalie mask (Warkwick during the 2010/2011 season), airbrushed by Steve Nash of EYECANDYAIR. 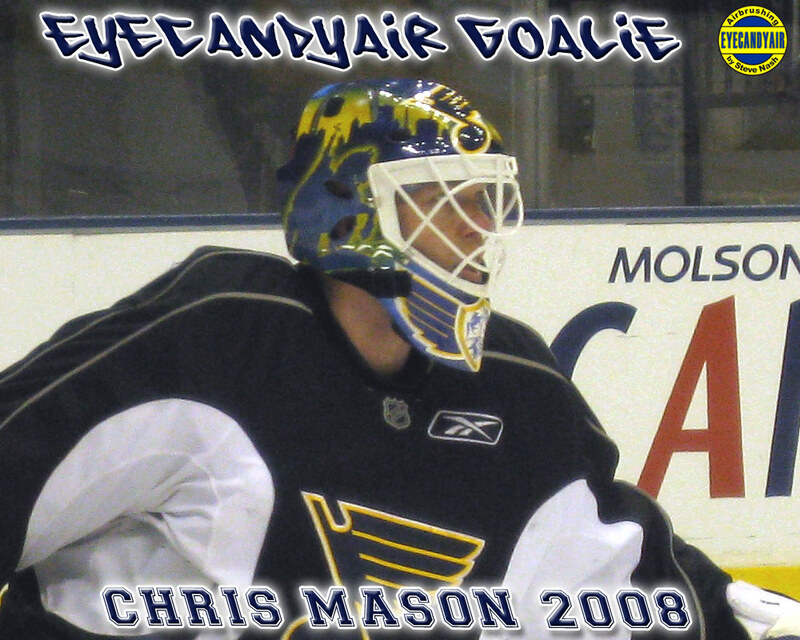 Chris Mason (now retired) was a goaltender for the Nashville Predators, Atlanta Thrashers, St. Louis Blues, Winnipeg Jets, Augsburger Panther (DEL)and was also a member of the 2007 IIHF World Championship Team Canada that won Goldwhen we had the opportunity to paint his masks. He wore a Sportmask goalie mask airbrushed by Steve Nash of EYECANDYAIR. Mike Murphy (now retired) was a goaltender for the Albany River Rats, Charlotte Checkers, HC Spartak Moscow and Dornbirner EC (EBEL) when we had the opportunity to paint his masks. He wore a Sportmask goalie mask airbrushed by Steve Nash of EYECANDYAIR. 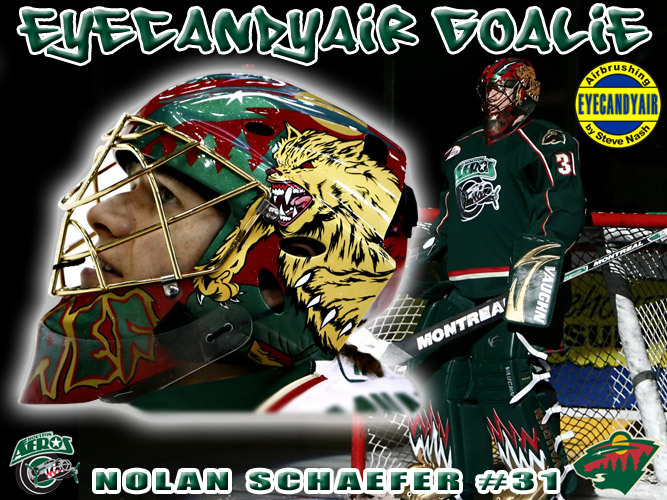 Nolan Schaefer, (now retired) was a goaltender for the Houston Aeros, HC CSKA MOSCOW, Providence Bruins, Charlotte Checkers, HC Spartak Moscow and HC Ambri-Piotta when we had the opportunity to paint his masks. He wore a Sportmask goalie mask airbrushed by Steve Nash of EYECANDYAIR. 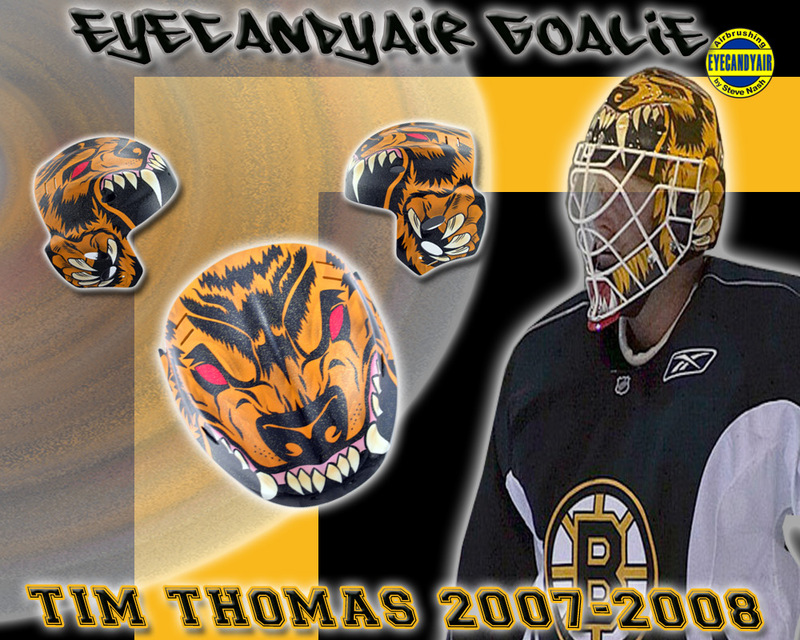 Tim Thomas (now retired) was a goaltender for the Boston Bruins and Florida Panthers when we had the opportunity to paint his masks. He wore a Sportmask Mage Pro-Custom airbrushed by Steve Nash of EYECANDYAIR. Tim has won the Vezina Trophy twice (2009 and 2011) along with the Conn Smythe and Stanley Cup in 2011. He was also part of the "2010 Winter Olympics" Team USA that brought home the Silver Medal. 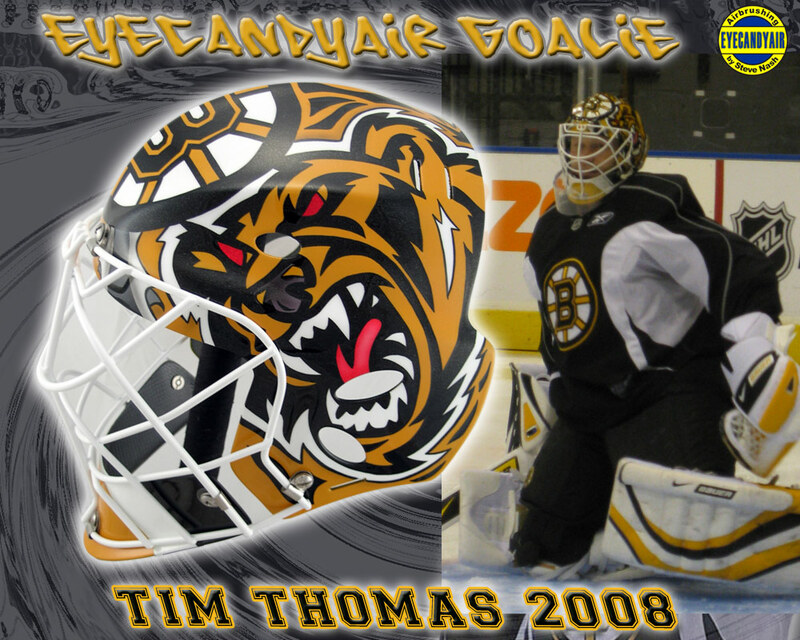 Tim was featured on the front cover and inside the #65 December/January 2007 issue of Goalies World wearing his "Evil Bear" paint design by EYECANDYAIR. 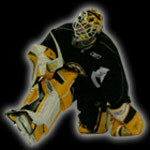 Tobias Stephan, is currently a goaltender for EV Zug (NLA/Switzerland). He wears a Sportmask Mage Pro airbrushed by Steve Nash of EYECANDYAIR. "A GOALIE MASK WITHOUT EYECANDY.....IS JUST A GOALIE MASK!"